The Two Chloés: plain chocolate bars taste test. Calorie Karma (magical calorie loss). Check our links, recent books read and assessed, best book read. The Chocolate Connoisseur by Chloé Doutre-Roussel. 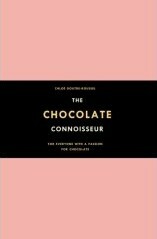 Chocolate: A Bittersweet Saga of Dark and Light by Mort Rosenblum. Alice Medrich on chocolate. Fran Bigelow on chocolate. Chocolate recipes. Je'oan D'ark Limoncello Truffles. Chocolate Diets: Women's Stress Buster and other Diet recommendations. Chocolate science: biology, chemistry, and psychology. Chocolate Taste Test method by Chantal Cody. Dolphin chocolate bars taste test. The Two Chloés: Vosges chocolate bars taste test. The Two Chloés: Zotter chocolate bars taste test. Plain Chocolate Bars Taste Test. Obtain a variety of high-quality PLAIN chocolate bars. C2: Chloé Deux, i.e. Chloé D'Ark. C3: Chloé Trois, i.e. Chloé-Eloise. The Two Chloés' chosen plain chocolate bars. Batch 3 was purchased March 1, 2007 at Fog City News, San Francisco. Valrhona Le Noir American 71% (dark bittersweet) and Valrhona 56% (semisweet) were purchased Trader Joe's as the calibration bars. 75%. Theo Ivory Coast 7/10. Aroma: Woodsy; mushrooms/earth; dark cherry. Snap: solid clean thunk; uniformly fine-grained, slightly granulated cross-section (but with a pinhole about every half-inch). Taste: Pretty good: Lacks the full-mouth feel of Valrhona Le Noir American 71%. 72%. Fran's 72% Bittersweet 6/10. Dark: tar; coal. Rich full-mouth feel. Not reported. 72%. Trader Joe's 72% Pound-Plus 3/10. Delicious. Rich full-mouth feel. As good as Valrhona Le Noir American 71%. Not reported. 71%. Valrhona Le Noir American (dark bittersweet) 9/10. Aroma: Berries; citrus. Taste: Best so far. Full-mouth feel. Bottom Line = Yuck (that's a technical term). Smell = good, but it's a single note smell. Sight = Very shiny surface, which I find unappealing - I associate it with cheap chocolate. Taste = bitter, harsh, maybe metallic, not well rounded. Slow to melt on tongue; distinct particles until it melts completely; then it's very smooth. 70%. Green and Black's Dark 70% 3/10. Wood, cherry, mushroom. Puckerish. Unenthusiastic for more. Not reported. 70%. Lindt "Excellence" 70% 7/10. Smell: Raspberry, cherry, wood. Taste: opens with a hint of pleasing sweetness that quickly deepens, and then finishes with a central pallet flourish. Not reported. 66%. Amedei Toscano Black 9/10. Aroma: Honey, honeysuckle; almonds. Taste: Pretty good, with a pleasant rising finish at rear center of palate and reaching for the cheek dimples -- a chocolate that literally makes me smile. Sweeter and lighter than Valrhona Le Noir American 71%. Bottom Line = Delightful, I would actually eat this plain (big praise from me). Taste = Sweeter, more full and rounded taste, and more balanced than Valrhona Le Noir American 71%. Has some "zingy" taste. I don't taste citrus but my mouth reacts as if I'm tasting something sour and it's a great combination with the chocolate. Some late note on back of tongue. 66%. Michael Cluizel: Concepcion plantation (Venezuela) 7/10. Aroma: Honey, honeysuckle; almonds. Appearance: Love the size of their little squares. Taste: Honey. Mushroom. Pear. Maple finish. Good but a little too sweet. Bottom Line = Boring. Taste = Sweeter and more rounded taste than Valrhona Le Noir American 71%; more full and balanced. Coats entire tongue and palate and lingers more than Amedei. More single note than Amedei Toscano Black. 66%. Valrhona: Caraïbe (Gran Cru) 7/10. Taste: Blueberry. Cherry. Berry. Bottom Line = Yuck, not quite as bad as Valrhona Le Noir American 71%; but i don't need to eat it. Taste = Like Valrhona Le Noir American 71%; in most characteristics, except a little sweeter. Splintery bite, single note, bitter, doesn't leave full-mouth taste. 65%. Fran's 65% Semisweet 7/10. Good. Slightly oily. Not reported. 65%. Hershey's Extra Dark 65% 3/10. Wood, smoke. Maybe brambles. Unenthusiastic for more. Not reported. 64%. Michael Cluizel: Maralumi plantation (Papua, New Guinea) 7/10. Appearance: Love the size of their little squares. Taste: Interestingly rich in fruit tastes. Raspberry. Some tastes are black currant, blackberry, gooseberry. Malt and honey finish. More interesting than Michael Cluizel: Concepcion plantation (Venezuela) 66%. Bottom Line = Very nice. I would eat this plain. This and the Amedei are the clear winners for me, and the only ones I would buy again. Smell = Some note on top of the simple dark chocolate smell. Taste = Excellent. Just the right give when I bite into it - not too splintery, not too soft. Tart - like blackberry? or kiwi? Chocolate is bitter enough, but not too bitter, and it marries well with fruit taste. 61%. Seeds of Change: La Dominica 61%. 9/10. Smell: Aroma of oranges. Taste: Citrus. Rich and lively. Not reported. 60%. Ghiradelli Square 60% 4/10. Wood, smoke, ash. Maybe dark berry. Unenthusiastic for more. Not reported. 58.5%. Bucare - Careno Superior (traditionally called the Barlovento) 8/10. Aroma: sweet chocolate. Taste: Berry. Cherry. Grapefruit. Honey. Bottom Line = Malted milk chocolate not to my taste. I wouldn't buy it. Smell = Pronounced vanilla. Taste = Sweet, one-note simple, easy to eat (which is boring to me). Tastes sort of like hot chocolate with milky taste and texture. At the end, malted-milk-ball flavor. 56%. Valrhona Le Noir 56% (semisweet). 8/10. Smell: Mushroom, loam. Taste: Honey. Pear. Mushroom. Almost as good as Seeds of Change: La Dominica 61%. Not reported. Sight = Appearance (0-1 possible points). Smell = Aroma (0-2 possible points). Sound = Snap (0-1 possible points). Touch = Texture (0-1 possible points). Try Dark Chocolate and Pumpkin Cheesecake. Or Caramel Banana Chocolate Chip Ice Cream. Forests and Trees disclaimer links book advice. Copyright © 2006-2016 by J. Zimmerman.